Near to the crystalline sea, in front of Bergeggi Island that is part of the Regional Protected Area and a Marine Reserve. 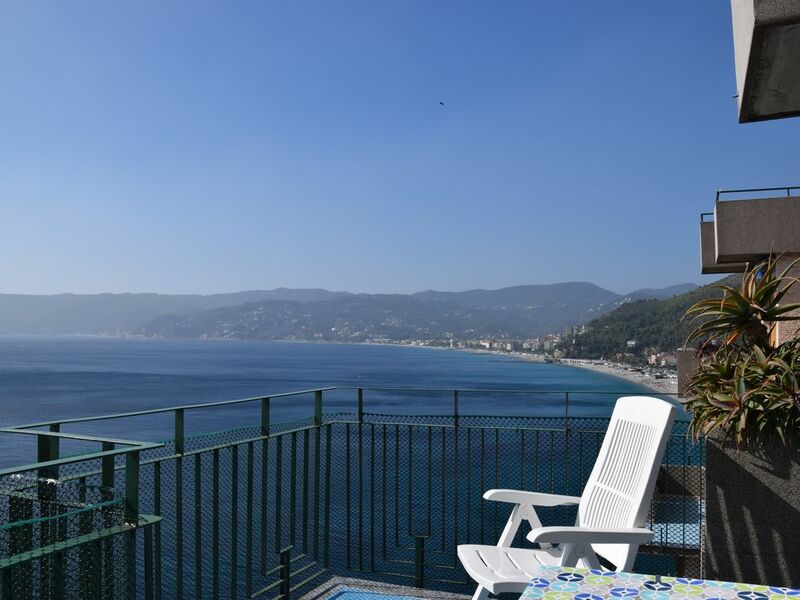 This spacious apartment in a cliffside 1960's condominium development (3 buildings) high above the Mediterranean in the Italian Riviera overlooks the beach and a small island with a tiny chapel and ruined watch tower. It has marble floors, high ceilings (chandelier in living/dining area), and a balcony running the width of the apartment to which the living/dining area and master bedroom open. There are large glass doors and tilting windows to enjoy the spectacular view, which often included a fishing boat unreeling or hauling in its net. We liked the vintage furniture. The large tiled bathroom has a multi-head shower/tub combination. The kitchen is fairly small, but well equipped (washer, dishwasher, 4 burner gas stove top/electric oven, table seating two, and pod espresso machine). There is a comfortable bed in the master, and two singles plus a rolling cot in the second bedroom. There is air-conditioning, but we did not need to use it (nor the heat from the same unit). Each apartment has roof-top parking for one car; on-street parking is also available. The entry to the building (with elevator) is at the fourth floor, the apartment is on the third. The only minor negatives: because the building is built into the cliff the windows in the kitchen, bath and second bedroom at the rear open on an air shaft, and there is some traffic noise from the coastal highway at the bottom of the cliff when sitting on the balcony. Owner Daniela is fluent in English (and French) and is often at her nearby house in Bergeggi. If she is not there, renters are greeted by her keyholder Bruna, who is friendly but doesn't speak English; Daniela would be available by phone to answer questions. Daniela enjoys the chance to speak English with renters, and enjoys travel (including a recent trip to New York). When asked, Daniela offered sight seeing suggestions. We visited medieval town centers in Noli, Finalborgo and Cervo, and went to the archeological museum in the Miramar fortress in Savona, Liguria's second-largest city. There are small supermarkets nearby and a large Coop ipermercato at the Molo 844 shopping center in Vado Ligure. Eine wunderschöne Wohnung mit bester Aussicht auf das Meer. Einfach unbezahlbar!!!! Sehr sehr freundliche Eigentümer. Frau Ferri und Herr Ferri sind sehr sympathisch sehr freundlich.Auch die Frau Carla Bruna die wir am Tag der Abreise kennengelernt haben ist sehr sympathisch und sehr freundlich. Unica difficoltà, per chi non ha l'auto, la distanza dai negozi. siamo stati molto bene nel suo appartamento abbiamo trovato tutto come descritto nel sito. La vista dal terrazzo e' fantastica. Grazie al clima che abbiamo trovato abbiamo potuto godere appieno del sole e trascorrere le nostre vacanze piacevolmente. gepflegte Wohnung mit Traum Aussicht und guter Lage. Wir haben die unkomplizierte Art der Vermieterin geschätzt. Die Wohnung ist gepflegt und sauber. Einzig die Matratzen sind für unseren Geschmack viel zu weich. Die Lage und Aussicht sind genial.